Various major investment deals signed in recent months, including those being penned this week in Eurasia, are on course and are evidence of Government's determination to turnaround Zimbabwe's economy, President Mnangagwa has said. It is in this context that President Mnangagwa is this week visiting Russia, Belarus, Kazakhstan and Belarus at the invitation of these nations' leaders, who want companies from their countries to pen their own chapter in the story of Zimbabwe's economic turnaround. 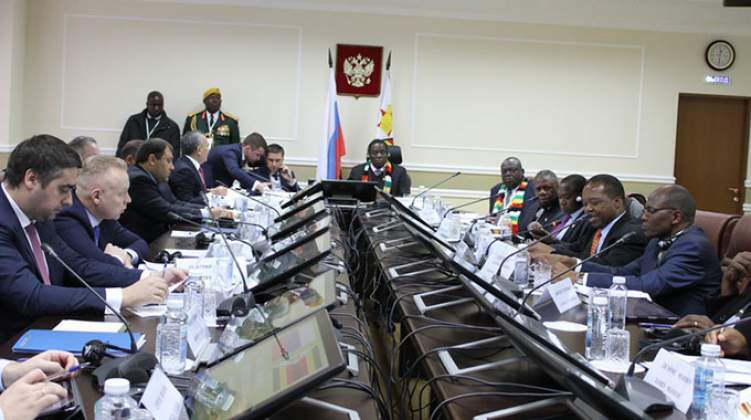 In an interview with Zimbabwean media in Moscow, where Government secured several major investment agreements, President Mnangagwa said while it was every citizens' democratic right to criticise the progress of the mega deals, the facts on the ground could not be ignored. The Head of State and Government said: "For instance, which project has not been fulfilled? Let's go one-by-one. "When I went to the People's Republic of China we were given US$1,3 billion for the Hwange Thermal units 7 and 8 expansion. So far, nearly US$200 million has been drawn down. No one is speaking about that, but they know it is there and it is functioning and that it has created more than 3 000 (jobs) in that place — but you ignore. "We also have the Robert Mugabe International Airport. In think it's worth US$154 million. And they are already on site and you ignore. "With the US$4,2 billion at Karo Resources in Chegutu, it is in two phases: the first phase is US$2,5 billion and they are drilling. And you're ignoring that." He went on: "That is why I am saying in a democratic country like Zimbabwe, people are allowed to dream, people are allowed to criticise. But no one loses sleep because of such negativity, because of people who just criticise. "But only when you are not doing anything, you will not be criticised. If you are doing something, then you find people are criticising you. That makes us in Government feel good because we are doing something. "I can go on. The Batoka Gorge scheme, it has been on for the last six or seven years. But look at what progress has been made now between Zimbabwe and Zambia. "Within the last ten months we have been able to agree, between me and my counterpart President (Edgar) Lungu, we have agreed and we have awarded the construction of Batoka (Hydro Power Station) to China Power and General Electric. That is progress. And it's a US$5,2 billion project, and you say nothing has happened and you think I can listen to such nonsense? "The facts are on the ground for those who want to see. I could go on and mention whatever project you may have in mind which you say is not being implemented; let's hear it. The Darwendale project: now we (have exchanged) the mining lease agreement with President Putin, and it's a huge platinum project. "Just yesterday we had very fruitful discussions with Alrosa, who are coming in for the development of our diamond industry sector. All those projects but there are some people whose heads are in the sand." Responding to uninformed claims, mainly being peddled on social media, that President Mnangagwa had been invited to economically insignificant countries, Zimbabwe's leader rhetorically asked: "Do we have oil like they do have?" President Mnangagwa said, "These two you are mentioning (Kazakhstan and Azerbaijan) are actually oil producers. We right now have problems back home in the area of oil. "But besides that, these countries have invited me to visit them. They would want to be part of the mantra 'Zimbabwe is Open for Business'. "The countries you have mentioned, Azerbaijan and Kazakhstan, have areas they have developed and they are willing to come and embrace Zimbabwe in agriculture and manufacturing. They would also want to see where they can strike a relationship where we can benefit from the abundant oil reserves which they have." On State's reaction to the violence instigated by opposition political groups this past week, ostensibly to protest fuel price increases, President Mnangagwa said it was illogical to castigate law enforcement agencies for doing their jobs. "I'm not sure there's a country which would have their security go to sleep when shops are being looted, when there is burning of tyres to stop people from going to work. "And then you have people focused on the effort to bring law and order and not focused on those who are breaking law and order in the country. You can see it's warped thinking by such people."